Who uses NASA Earth science data? Dr. Sergio Signorini, to study the impact of climate variability on phytoplankton and Earth’s oceans. 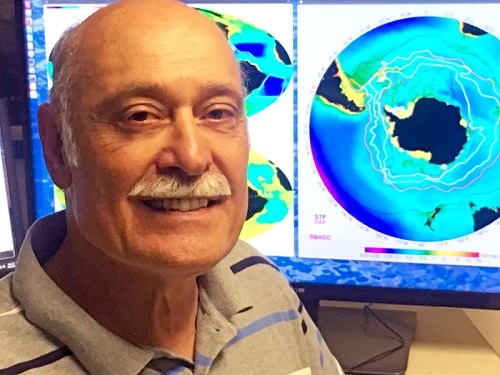 Dr. Sergio Signorini with a SeaWiFS image showing averaged chlorophyll concentrations around Antarctica and South America. Yellow and green colors in the image are areas of higher chlorophyll concentrations. Image courtesy of Dr. Signorini. Research interests: The ocean carbon cycle and the impact of climate variability on the ocean’s physical and biological properties. Research highlights: The color of the ocean tells an ever-changing story. From the swirls of blue-green phytoplankton indicating masses of living microorganisms to dark areas of suspended sediment discharged by rivers where they meet the sea, ocean color data help unlock vital information about an ecosystem that covers more than 70% of Earth’s surface and makes up about 97% of Earth’s water, according to the National Oceanic and Atmospheric Administration. NASA’s primary source for ocean color data is the Ocean Biology Distributed Active Archive Center (OB.DAAC) at NASA’s Goddard Space Flight Center in Greenbelt, MD. This is also where Dr. Sergio Signorini conducts research using a combination of remotely-sensed ocean color data from satellites and field data from ship surveys, ocean buoys, floats, and other sources. One of Dr. Signorini’s research interests is investigating ocean acidification, or OA. OA occurs when carbon dioxide (CO2) is absorbed by seawater and dissolves, forming carbonic acid and lowering overall seawater pH. A pH lower than 7 on the 0 to 14 pH scale is considered acidic; a pH above 7 is considered alkaline. Historically, ocean pH is about 8.2, or slightly alkaline. However, ocean pH has decreased to closer to 8.0 since the start of the industrial revolution and continues to become more acidic, according to data from the Carbon Monitoring System (CMS) and NOAA’s Ocean Carbon and Acidification (OC&A) Data Portal at the National Centers for Environmental Information (NCEI). Lower ocean pH can inhibit shell growth in marine animals and may cause reproductive disorders in certain fish species. In a study of ocean and coastal acidification off New England and Nova Scotia, Dr. Signorini was part of a team that determined that the input of significant freshwater into the ocean from rivers and other sources has reduced the ability of these ocean waters to neutralize carbonic acid and made these areas more susceptible to acidification. Dr. Signorini notes that despite the vulnerability of these waters to acidification and the impact lower ocean pH may have on fisheries, it’s unclear at this time how the region’s ecosystems will respond to acidification. A key parameter for monitoring OA is the partial pressure of CO2 (denoted pCO2) in seawater. In a study of pCO2 conducted along the eastern North American continental shelf, Dr. Signorini used satellite data (primarily data collected by the Moderate Resolution Imaging Spectroradiometer [MODIS] instrument aboard the Aqua satellite) and field data to relate surface ocean pCO2 values and changes in sea-air CO2 exchanges to sea surface temperature (SST), surface salinity, and chlorophyll concentrations. Dr. Signorini and his colleagues used the resulting equations, along with inputs from corresponding satellite products, to assess the spatial and temporal variability of surface ocean pCO2 and changes in sea-air CO2 for the North American East Coast. The research team found that temperature and changes in the amount of dissolved inorganic carbon are the most influential factors driving seasonal changes in pCO2 values along the U.S. East Coast and note that the sea-air CO2 flux estimates provide an important component of the inorganic carbon budget on the continental shelf. In fact, the algorithm developed during this research also was used in Dr. Signorini’s investigations of OA in coastal oceans, described above. Coastal oceans also are a critical component of the global carbon cycle. Dr. Signorini currently is part of a multi-disciplinary, multi-institutional investigation studying the carbon budget of the eastern U.S. continental shelf (the U.S. Eastern Continental Shelf Carbon Budget: Modeling, Data Assimilation, and Analysis). As part of this investigation, data from satellite and ocean model products are integrated to examine dissolved organic carbon (DOC) fluxes in the Middle Atlantic Bight (MAB). A “bight” is the name given to a bend or curve in a coastline or a bay formed by this sort of curve; the MAB is the gradual curve in the U.S. Atlantic Coast extending from Massachusetts to North Carolina. The objective of this research is to develop satellite algorithms to retrieve DOC concentrations and then combine the resulting satellite data with physical circulation model products to quantify changes in DOC flux on the continental shelf boundaries. Dr. Signorini and his colleagues already have found that the discharge of water from estuaries into the MAB plays an important role in the seasonal and interannual variability of DOC and DOC flux on the continental shelf, as well as on the overall coastal carbon budget. CO2 and DOC also are important aspects of ocean net primary productivity. Phytoplankton (microscopic plant-like organisms that make up the base of the ocean’s food pyramid) convert atmospheric CO2 into food via photosynthesis, much like vegetation on land. In fact, phytoplankton comprise about half of Earth’s net primary production, which is the amount of CO2 a plant takes in during photosynthesis minus how much CO2 the plant releases during respiration. Chlorophyll in phytoplankton are responsible for photosynthesis and energy production, and chlorophyll concentrations can be measured from space by sensors such as MODIS/Aqua (operational 2002-present), the Visible Infrared Imaging Radiometer Suite (VIIRS), 2011-present; and the Sea-Viewing Wide Field-of-view Sensor (SeaWiFS), 1997-2010. In addition to chlorophyll, many other important ocean color data products can be retrieved from these satellites, as seen below in the representative data products used section. In a global survey of ocean phytoplankton that is part of the American Meteorological Society’s State of the Climate 2016, Dr. Signorini and colleagues used combined MODIS, VIIRS, and SeaWiFS observations to evaluate global chlorophyll concentrations. These remotely-sensed chlorophyll concentrations are then used as a proxy for determining phytoplankton abundance, and were compared with the 19-year record of satellite chlorophyll observations (starting with SeaWiFS in 1997). Variations in SST, nutrient availability, and the amount of light available for photosynthesis are the primary factors affecting chlorophyll and, through this, phytoplankton concentrations. The research team note that 2016 was a transition year from El Niño conditions (warmer than normal SST off the western coast of South America) to La Niña conditions (cooler than normal SST off the western coast of South America). This transition was the dominant driver of phytoplankton concentrations along the equatorial Pacific Ocean, which were elevated 10% to 20% over the climatological mean. North and south of the equatorial Pacific Ocean, chlorophyll concentrations were lower relative to climatological values. Dr. Signorini observes that satellite data provide an invaluable global view of the oceans, with temporal and spatial resolutions far superior to what can be achieved with more traditional ocean-based data collection methods. The color of the ocean, especially when observed from space, can give scientists and researchers like Dr. Signorini their first indication of a new story being told by this vital resource. Franz, B.A., Behrenfeld, M.J., Siegel, D.A. & Signorini, S.R. (2017). Global ocean phytoplankton [in “State of the Climate in 2016”]. Bulletin of the American Meteorological Society, 98(8): S87-S89 [http://doi.org/10.1175/2017BAMSStateoftheClimate.1]. Mannino, A., Signorini, S.R., Novak, M.G., Wilkin, J., Friedrichs, M.A.M. & Najjar, R.G. (2016). “Dissolved organic carbon fluxes in the Middle Atlantic Bight: An integrated approach based on satellite data and ocean model products.” Journal of Geophysical Research: Biogeosciences, 121(2): 312-336 [http://doi.org/10.1002/2015JG003031]. Gledhill, D.K., White, M.M, Salisbury, J., Thomas, H., Mlsna, I., Liebman, M., Mook, B., Grear, J., Candelmo, A.C., Chambers, R.C., Gobler, C.J., Hunt, C.W., King, A.L., Price, N.N., Signorini, S.R., Stancioff, E., Stymiest, C., Wahle, R.A., Waller, J.D., Rebuck, N.D., Wang, Z.A., Capson, T.L., Morrison, J.R., Cooley, S.R. & Doney, S.C. (2015). “Ocean and coastal acidification off New England and Nova Scotia.” Oceanography, 25(2):182–197 [http://doi.org/10.5670/oceanog.2015.41]. Signorini, S.R., Mannino, A., Najjar, R.G., Friedrichs, M.A.M., Cai, W-J., Salisbury, J., Wang, Z.A., Thomas, H. & Shadwick, E. (2013). “Surface ocean pCO2 seasonality and sea-air CO2 flux estimates for the North American east coast.” Journal of Geophysical Research: Oceans, 118(10): 5439-5460 [http://doi.org/10.1002/jgrc.20369].